UFW Stories: "Connecting Life, Academic, and Activist Organizing to the UFW"
"Connecting Life, Academic, and Activist Organizing to the UFW"
My involvement with farm worker issues and ultimately with the UFW has its roots in the connections between my lived experience as the immigrant son of farm worker parents and the lessons learned in overcoming systemic obstacles as a community organizer and intellectual activist. Whenever the road in academia got rough and I had to face another hurdle, I always remembered the difficulties that my immigrant farm worker family had to face. In this way, the problems I encountered in academia appeared smaller and more manageable. My struggles with learning English and growing up in a poor immigrant farm worker family, became the foundations of language, labor, and immigration issues that I passionately took up in my organizing, teaching, and research as an activist intellectual in academia. Encouraged by a high school counselor that I could succeed in sports, I attended Northeastern Jr. College in Sterling, Colorado on a track scholarship. By my second year, I got involved in student government and decided to focus on my studies. I worked alongside other students in questioning why a meatpacking plant across from the library created such a bad odor that permeated the whole city. Some of us began to research the plant and found that the company had been cited for polluting a stream near the plant site. We took our research and turned it into action by organizing a demonstration that resulted in the closing of the plant until it dealt with its pollution problems. The significance of this first organizing experience is that I began to learn about the potential for turning research data into action for social change. Motivated by this discovery, I applied and was accepted to the University of Colorado as a major in Communications. During my involvement in the anti-war movement, between 1968 and 1971, I also became active in the struggles to get more students of color on campus. I joined the United Mexican American Students in asking for funds to develop summer programs to prepare Chicano/a students to go to College. We occupied a building on campus when Board of Regents representative Joe Coors took a position that minority students were not as qualified to attend the university as other students and that no funds should be used for their recruitment. The first summer programs were developed after we were able to show that there were dozens of qualified Chicano/a students that could be admitted to the university but lacked the necessary resources to survive. Out of those summer programs, I met students who eventually went on to become social workers, teachers, lawyers, doctors, community organizers and political leaders. While organizing on campus, I met various students who were involved with a farm worker support group on the campus. In addition to getting the student senate to allocate funds for the group, I joined them in traveling to Center, Colorado and joining striking lettuce workers on the picket line. It also led me to make connections between the farm worker movement and the anti-war movement. For one of my classes at C. U., I wrote a paper called the “Rhetoric of the Chicano Movement.” In looking at the persuasion strategies of leaders in the Chicano Movement, I was most impressed with the strategies of Cesar Chavez. In carrying out the research, I was shocked to find that the Defense Department, under the Nixon administration, was buying tons of grapes when the farm workers were on strike.. This really affected me since I had witnessed the burial of various friends who had died in the war. On the one hand, the labor of the farm workers was being used to increase the profits and power of large agribusiness corporations. On the other, the sons of these farm workers were being drafted in disproportionate numbers, representing 20 percent of those who died on the front lines. Feeling that I could do something about these injustices, I decided to go and learn firsthand about Cesar Chavez’s union. With only fifty seven dollars in my pocket, I caught a Greyhound bus that took me to Delano, California. Here, I observed the organizing strategies of Cesar Chavez and the violence that was being waged by the growers against the farm workers. I also heard a speech by Cesar Chavez that changed my life. In challenging the young students volunteering with the union, Cesar proposed that “we have only one life to live” and that “the highest level of using your life is in service to others.” It was after this experience that I made the decision to return to northern Colorado and to use my education to organize against systemic injustices that had kept farm worker and immigrant communities at the lowest levels of the economic ladder. The sacrifices of farm worker organizers, including Cesar Chavez, who received only $5 a week for their organizing efforts, inspired me in this direction. Galvanized by my experience with the farm workers, I returned to Ault, Colorado, where I had grown up, and began my organizing efforts. I first developed a community center out of a garage in my parents’ backyard. I painted the center red with a giant black huelga eagle on the side. Remembering the difficulties that I had faced in not knowing English at an early age, I used the methods of Paolo Freire in teaching young Mexican farmworker children how to speak English. These educational strategies would later become a part of my teaching methods in the college classroom. I also used the research skills that I had obtained from my undergraduate education to discover that 8 out of 10 Mexican children who started in the first grade in Ault eventually dropped out of school. After sharing this information with the students and their parents, they collectively used this research to appear before the school board to demand that bilingual education be instituted in the school district. The response of one school board member was that if we wanted bilingual education, we could “return to Mexico.” This response led to a seventy mile protest march, in the tradition of Cesar Chavez, from Ault to the state capital in Denver. Our efforts, coupled with organized student walk-outs, led to an ongoing social movement in the region that resulted in the establishment of bilingual education programs and the hiring of bilingual teachers and administrators in many Weld County schools. As a result of these organizing efforts in the next few years, I was asked to teach a class called “The Community” at Aims Jr. College. The class was my first major experience in having students connect the classroom to community service and social change issues. In supporting the efforts of the UFW, my students organized daily pickets at liquor stores in support of the grape boycott. In hearing about the successes of the class, the Sociology Department chair at the University of Northern Colorado asked me to teach a similar class there. Before long, without a Master’s degree, I was teaching the equivalent of a full-time professor (on part-time pay). The experience of teaching Sociology classes strengthened my affinity for the field of Sociology. Simultaneously, it allowed me to experiment with various forms of using critical pedagogy and research by having students conduct research on migrant housing through the Colorado Migrant Council and volunteer at a community center that we developed in the North Side of Greeley, Colorado. I did not know it then, but these organizing efforts laid the foundation necessary for completing my PhD and being a teacher and researcher at the college level. For the next twelve years, I survived on very little income, but I was sustained by the spirit and passion of the farm worker, immigrant, student, and poor communities that I collaborated with. The examples of such boycott leaders, such as Jerry Ryan and Len Avila, who turned away from luxury to devote their lives to building a more just and equal society, energized me. In 1984, after marrying and having children, I faced the reality of looking for a long-term career that would allow me to ensure my responsibilities to family as well as allowing me to continue my commitment to community organizing and social change. After coming across an announcement for a graduate fellowship at UCLA, I filled out an application and obtained recommendation letters from my former undergraduate professors. In June of 1984, I was accepted to UCLA. Although saddened at the prospect of leaving our friends and families, my wife Rose and I agreed that that we could no longer survive on part-time jobs in the Greeley area and that we had to plan for the long-term. I survived the dissertation process, graduated from UCLA in 1991, and landed a position in Sociology and Chicano Studies at Pitzer College in Claremont, California. I had planned with my family to return to Colorado but there were no jobs available there in my field at the time. Nevertheless, I was drawn to Pitzer by its ethos of advancing intercultural and interdisciplinary understanding in the context of social responsibility. It was the type of place that fit with my passion of connecting the academic world with social change. In reflecting on my lived experience as a farm worker and the impact that Cesar Chavez had on my life, I sought to develop a class that would have the same influence that the farm worker social movement had on my life. Out of this passion and with the help of various farm worker contacts, I developed a class called Rural and Urban Ethnic Movements. In this class, which is now in its twentieth year, students learn about community-based organizing theories and how they apply to the civil rights, farm worker, immigrant, and contemporary social movements. In the first years of our visits, the students were able to hear about the hardships of the Filipinos through those who were still alive. In our first year, a diverse group of students worked alongside Pete Velasco, the former president of the United Farm Worker’s union, in planting a hundred roses at the grave site of Cesar Chavez. In the process, he shared the many stories as to why many Filipinos became disconnected from their families. It is the story of many immigrants who come to this country looking for the American Dream, not finding it, and creating stories to their loved ones abroad as to why the relatives should not visit them. Ultimately, as a result of being caught in the lowest levels of the stratification structure with no way to get out, they lose all contact with their homeland. This was the case of many Filipino farm workers who grew old and, when it came time for them to retire, had no place to go. It was out of this reality that the United Farm Worker’s union, with the help of many college students, constructed a retirement home, Agbayani Village, for the elderly Filipinos. When my students visited Agbayanit Village and heard these stories while planting roses alongside farm worker leader Pete Velasco, the students decided that the stories needed to be told to other students and faculty. Realizing that they needed funds for this purpose, the students tapped a fund that was meant for “academic scholars.” Although Brother Pete did not have an academic background, the students argued that his experiential knowledge offered an insight to the history of Filipino workers that were often excluded from academia. Subsequently, a “scholar’s proposal” was funded allowing Brother Pete and Dolores Velasco to spend a week sharing their stories in the classrooms at Pitzer College. In addition to “teaching” students about the history of the farm workers and the role that the Filipinos played in that movement, Brother Pete moved the students to action. Noticing that the grapes that were being served in the college dining hall were non-union, Brother Pete challenged the students to put their “learning into action.” Subsequently, by the middle of the week, the students called for a boycott of the cafeteria and passed out leaflets to students at all the entrances. After two days of this action, the Aramark Corporation called for a meeting with the students and, with Brother Pete sitting in, agreed to signing an agreement that they would not serve grapes until they were unionized. This successful action by the students was exemplary in many ways. First, the students brought to “center stage” a farm worker leader who shared the history of Filipino farm workers, a history that is often left out of our history books. Secondly, the act of treating Brother Pete as a scholar helped to preserve a history in the process of learning about this history. Third, the academic knowledge that students were learning from their books was transformed into a direct form of engagement that resulted in outcomes that simultaneously informed the campus community about the farm worker social movement and advanced an outcome that directly aided striking farm workers in the fields.. It was also an example of building an empathy that would be the basis for building the strength of a future partnership. When Brother Pete left the campus, he wrote a twenty seven page to the students and thanked them for treating him, not just as a farm worker organizer, but as a scholar. Subsequently, in the following year, when Brother Pete died from terminal cancer, the students were invited to help carry his casket and to participate in holding flags at an all-night vigil in La Paz (Keene, CA). To commemorate this beginning partnership, the farm workers donated a dozen union roses that the students took back and planted in a designated section of Pitzer’s community garden. In the following year, a farm worker carpenter, who learned about the garden, made a sign that is still there today and reads “farm worker garden.” In addition to the roses and the sign, the garden includes a bench with wording on a plaque that commemorates Brother Pete, Cesar Chavez, and the historical partnership that has developed over the years between the farm workers and the students. Today, after nineteen years of this annual Spring Break experience with the farm workers, Dolores Velasco still greets the students every year at the entrance to La Paz (Keene, CA) and she is always the last one to bid us farewell. Our Spring Break always ends with a circle ceremony and quotes from Brother Pete at the grave site of Brother Pete. Over the years, the partnership with this site has been strengthened and has allowed for students both to carry out service learning projects as well as carry out community-based research. The partnership has also been exemplary in redefining the meaning of “service learning” to include social change organizing where the students organize actions in support of farm workers issues. In recent years, the social change learning has included the making and distribution of leaflets, posters, banners, flags, and press releases for various types of public actions. 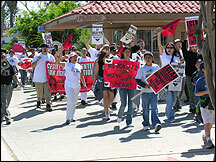 In Bakersfield, it has been a tradition to rally on the four corners of a mall in Bakersfield and carry out advocacy education in support of unionization campaigns in the fields, a Cesar Chavez national holiday, AgJobs, card check legislation, and efforts to ensure water and shade for all farm workers. Another action that can be considered “service” but takes on a social change character of presenting outcomes and raising consciousness is the use of the methodolocy of “teatro,” once used by the UFW and Teatro Campesino as a means of training new leadership. When the students first arrive at La Paz, they are divided into various groups and informed that they should collectively document all their experiences because, on the last day of their visit, they will present a summary of what they have learned in the form of a “treatro.” The final outcomes, with at least five teatros presented to dozens of UFW workers and staff members in La Paz, have always resulted in “moving” and “emotional” presentations that invigorate all the participants. This spirit of creating social change continues when the students return to the Pitzer campus and join in organizing various activities including: organizing a breakfast/luncheon (to honor community leaders who represent the values of Cesar Chavez) and a pilgrimage march promoting civic engagement, non-violence, and using one’s life to empower others. The character of this learning is “social change” learning because the outcome is one that is consciously designed to go beyond charity projects that often disempower the participants. One lesson that I have learned in creating a democratic classroom and having students think critically about the social issues around them is that the students’ growing conscience and engagement often lead to collective action. This was the case when some students at Pitzer, motivated by their experiences of working in service learning projects with unions, day laborers and farm workers, joined the college’s cafeteria workers in their efforts to obtain higher wages and better health benefits. As early as 1991, when I began as a professor at Pitzer, a collaboration developed between the cafeteria workers and various faculty and student leaders to address worker grievances. One student, Juan de Lara, who later went on to become Pitzer’s first Rhodes scholar, met with cafeteria supervisors when the workers faced problems. This practice continued throughout the years until students and workers agreed that the grievances could be handled more efficiently through a union. After vocal demonstrations by the workers and students, the workers joined the Hotel and Restaurant Worker’s Union (HERE). Today, these organizing efforts continue on and off campus. One’s cup is always filled by knowing of the dozens of students who, as a result of this class and their experiences with the UFW, are now social change transformative leaders in union, educational, political, academic, faith, and community-based positions.